I enjoy watching reality TV shows, especially those that have something to do with cooking. I love learning and experiencing vicariously through the contestants on the show. It is interesting to see how they handle the challenges that are being hurled their way. One of these shows is the famed Top Chef on Bravo Network. They have what they call the quick fire challenges (minor challenges to test their individual skills) where the winner gets the immunity from elimination for the next major (teamwork) challenge. 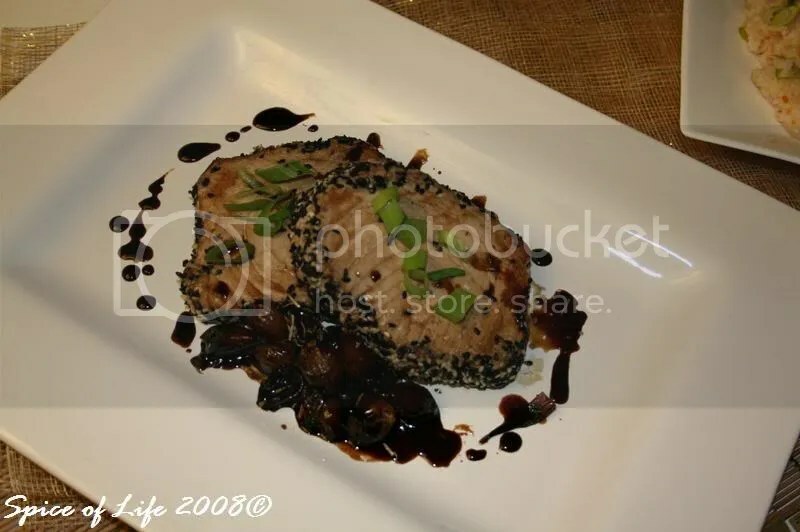 One of the quickfire challenges that they had was to come up with a dish using just 7 ingredients (if I’m not mistaken), excluding oil, salt, pepper and sugar. Well, our dinner tonight reminds me of that challenge. This dish only requires a total of 6 ingredients… yes, 6 ingredients, not counting the salt, pepper and oil. And what more, it only takes about 30 minutes to prepare. I have learned all these years that the best dishes are prepared simply. 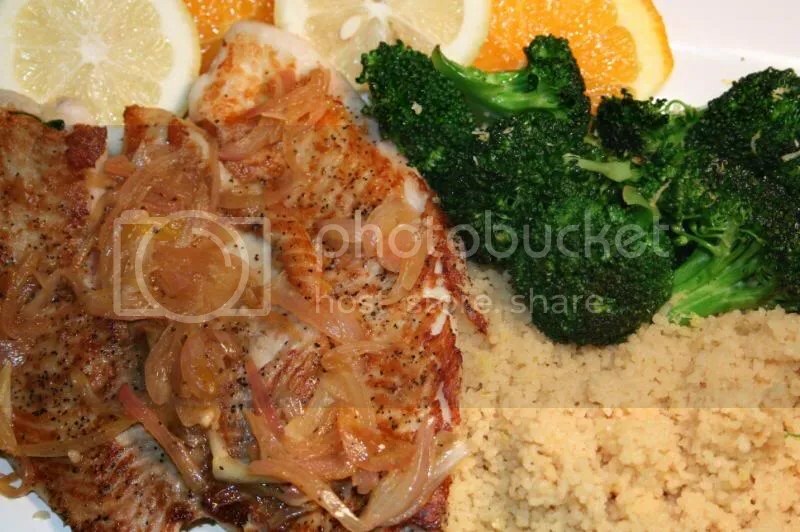 The flavors of this dish do not disappoint, and I am sure you’re going to enjoy this – if you like fish, that is. 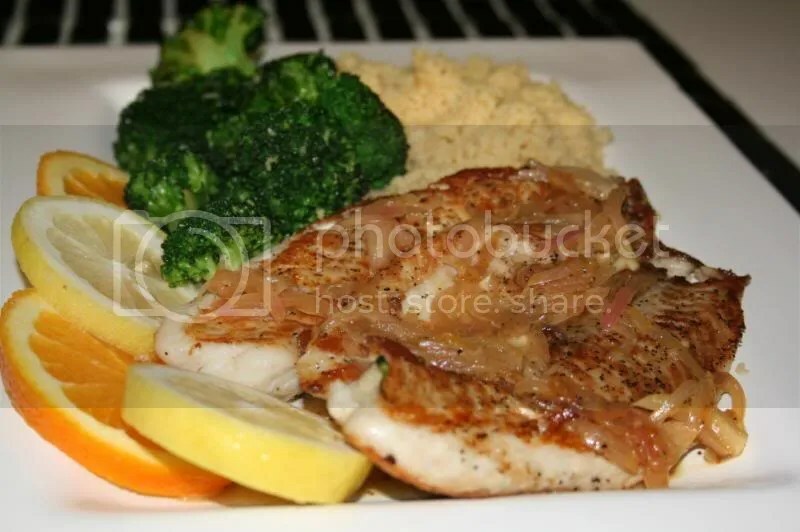 I served the fish with a plain couscous and steamed broccoli with lemon. 1. Heat a non-stick skilet over medium-high heat. Coat pan with cooking spray. 2. Sprinkle fish evenly with 1/4 salt and 1/4 pepper. 3. Add fillets to pan. Cook for 4 minutes per side or until fish flakes easily. 5. Add white wine to pan. Cook 30 seconds or until liquid almost evaporates. 6. Add shallots and remaining ingredients, stirring well with a whisk. 7. Stir in remaining salt and pepper; saute 1 minute or until thoroughly heated, stirring frequently. 8. Top each serving of fillet with about 3 tbsp of sauce. NOTE: This dish actually calls for sherry vinegar. So if you have it, I’d recommend you use it instead. 1. Bring the chicken broth to a boil. 2. Add the butter, followed by the couscous. 3. Turn off heat. Cover. Let stand for 5 minutes. 4. Fluff couscous with fork and serve. One of the advantages of growing up in a tropical island like the Philippines is having access to fresh seafood. I grew up eating fresh seafood. And I mean just-caught-that-day-kinda-fresh, so fresh some were still squiggling and jumping out from the containers! None of those previously frozen stuff…uh,oh. Tonight’s dinner was pasta with fish. Not from the can but fresh fish. Fortunately, I didn’t have to clean the fish like I learned back in the Philippines, as I already got my fish filleted. I never had pasta with fish before, apart from having tuna casserole (which uses canned tuna), so it doesn’t count for me. And I’m glad I tried this. This is definitely a keeper. 1. Cook pasta until al dente (firm to the bite), about 8-10 minutes. Drain. 2. Meanwhile, place a large, heavy skillet over medium-high heat. Add the 1/3 cup olive oil, garlic, red chili flakes, and 1/4 cup parsley. Stir and cook until fragrant, about 1 to 2 minutes. Add the eggplant and cook until tender, about 5 minutes. Remove the eggplant from the pan and set aside. 3. 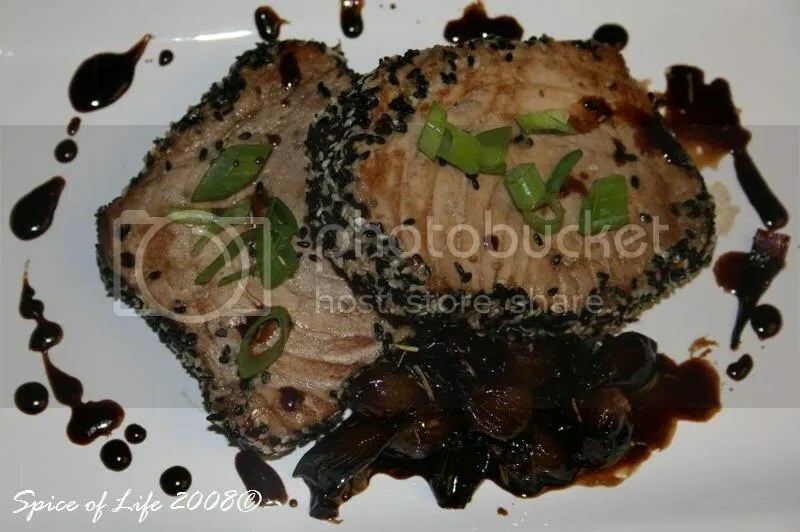 Season the swordfish cubes with salt and pepper. 4. Using the same pan, over medium-high heat, add the 2 remaining tablespoons of olive oil and cook the swordfish until opaque, about 5 minutes. Add the white wine and cook until almost evaporated, about 2 minutes. Turn off the heat. Add the tomatoes, eggplant, cooked pasta, the remaining 1/3 cup parsley and stir. Drizzle with extra-virgin olive oil and sprinkle with the salt and pepper. Stir to combine. This recipe was adapted from Giada De Laurentiis‘. I rarely follow a recipe to a T as I make my food according to how I prefer them. So for my version, I sauteed onion with my garlic. Also, I used whole grain Penne for my pasta. I used Japanese eggplant as they are not bitter like those large ones, though I’m sure you can still use the bigger varieties. I’d suggest washing them with salt and water first to get the bitterness out of them. I got my Japanese eggplant from the Asian market, as my local grocery store did not have them. Also, it isn’t suggested in the recipe, but I seasoned the eggplants with salt and pepper when I sauteed them, so the eggplant themselves will have flavor. 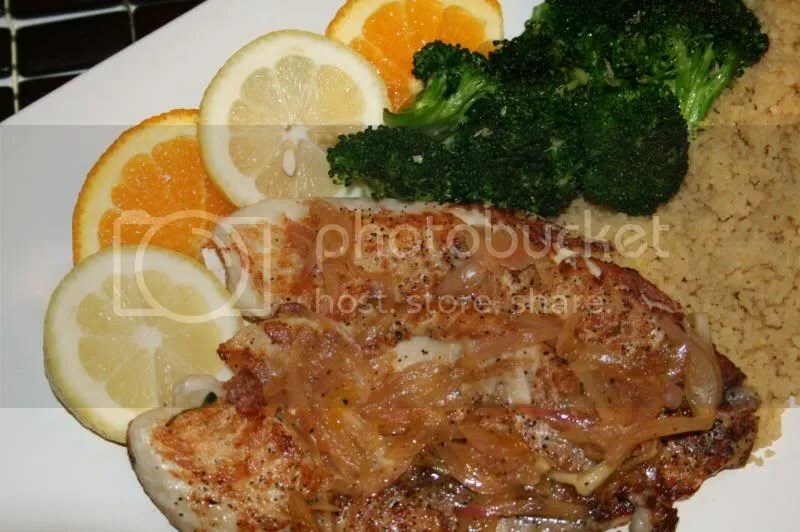 When I sauteed the fish, I added chopped rosemary and thyme as well. I know that these herbs work well with swordfish. As you can see, I didn’t have the yellow teardrop tomato but I imagine that the pasta would have looked even more attractive with the yellow tomatoes in it. I just love parmesan so I grated a bit of the cheese on top when I served the pasta. Italians don’t recommend adding cheese to seafood, and I don’t know why. But then again, I’m not Italian so I will do it the way I love it. The colors of this pasta are wonderful. And it definitely tastes as good as it looks- no, not fishy at all. Just fabulous! 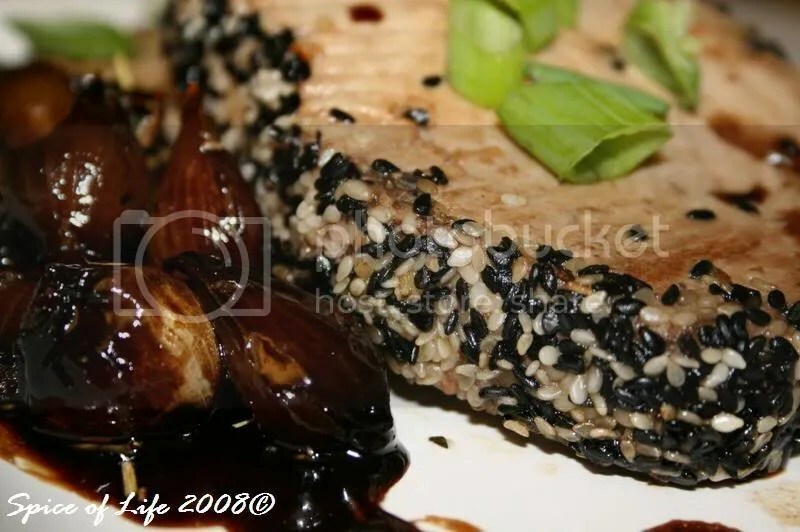 This recipe was adapted from Giada De Laurentiis‘. I rarely follow a recipe to a T as I make my food according to how I prefer them. So for my version, I sauteed onion with my garlic. Also, I used whole grain Penne for my pasta. 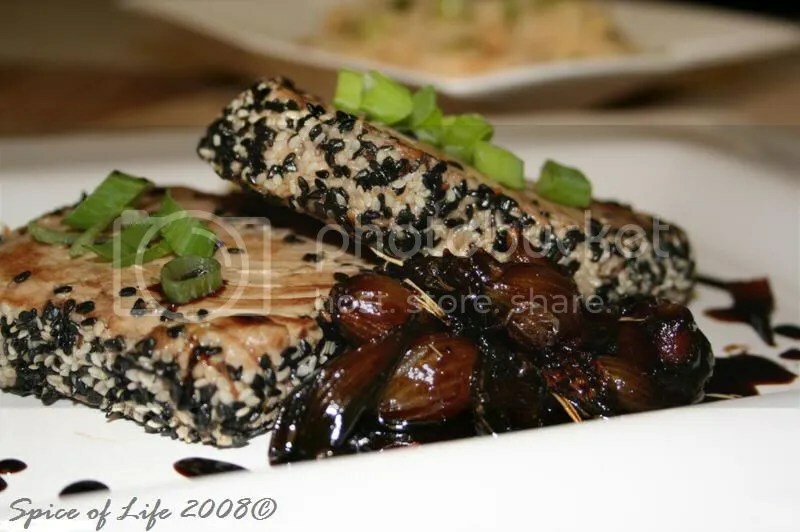 I used Japanese eggplant as they are not bitter like those large ones, though I’m sure you can also use the bigger varieties. I’d suggest washing them with salt and water first to get the bitterness out of them. I got my Japanese eggplant from the Asian market, as my local grocery store did not have them.